I offer private and group tutoring for college-bound, transfer and graduate school students working on admission and scholarship essays. Depending on where you live, I can help you privately in my home office in Laguna Beach, or work long-distance through Skype. I work with students from all over the world! No matter where you are in the process, I work as an editor, helping you brainstorm a focused, compelling topic, and then structure, compose, revise and polish your essay. I do not write essays for students. Jumpstart Session: During these hourlong one-on-one sessions, I help you identify powerful topics for your core and supplemental essay prompts, find your real-life stories, map out a narrative writing plan and dig deep to craft a personal, meaningful and memorable essay. 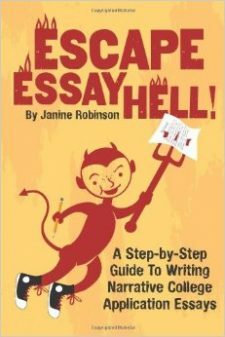 Includes free copies of my writing guides and workbook. Cost: $200. We work for an hour together in person or via Skype, Google Hangouts or Facetime. Editing/Review: I review rough drafts and provide feedback and suggested edits to improve focus, clarity, flow, impact and meaning; edit length to meet word counts; and, correct grammar, spelling, word choice and other mechanics—all using either Google docs or in Word, called Track Changes (see example of Track Changes editing marks), so students can see my advice and suggested edits. Cost: $400 for all four University of California short essays (350 word limit each), called Personal Insight Questions ($100 each) using Google docs or Track Changes in a Word file. (Same cost for four UC transfer essays.) Final proofreading (for typos, spelling, flow, mechanics, clarity, etc. ), if needed, $100. Cost: $300 for one round suggested edits and feedback for every 700-800 words of supplemental essays (usually about 3-5 short supplemental essays) using Google docs or Track Changes in Word docs. For most students, one round of edits on a core essay—especially if they started with a Jumpstart session or online Bootcamp to get them on the right track—is enough to help them advance and complete one core essay. Depending on their writing/editing ability, some students (roughly about a fourth) want/need a second round of edits to get it in top shape. Some students—usually those who did not start the brainstorming/planning process with me—send in essays to be edited that are fundamentally off track (poor topic, lack of focus/main point, structure wrong, etc.) If I think I can’t help them improve their draft through written edits, I will send it back with my advice and ideas on what they need to do (no charge, of course). Usually I suggest a Jumpstart session. Turnaround for each round of edits is within a week at latest and usually sooner. Expedited fees: Two-day turnaround: $100 extra. Overnight: $200 extra. All clients must pay in advance of my services (below), and then as they go for editing help. Email me anytime with questions: EssayHell@gmail.com. Just email me at: EssayHell@Gmail.com. Thanks! Please use the DONATE “Buy Now” Button below to pay agreed-upon fee (examples: $200 Jumpstart session; $200 core essay edit; $400 UC edits, etc. ).